Our National Unemployment Rate is at a 17 YEAR LOW! More people are renting than at any other point in the past 50 YEARS! 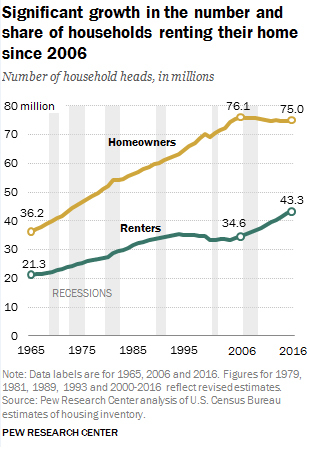 Over the Past Decade, Households Headed by Renters Grew by Nearly Ten Percent! 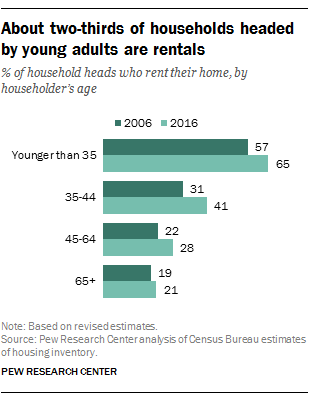 Sixty-five percent of Households Headed by Young Adults under Age 35 are Renters. Larger amounts of student debt are said to be one of the many reasons why many Americans see the appeal of renting. Low Unemployment, Rising Number of Renters, and Steady Low Interest Rates, are all positive factors for a great Recipe for Success in 2018 for Investment Property owners. Now, is the time to shop around for the right Investment Property. BUT, do not jump in without doing your homework. Expect to put at least 20% down to get your Investment Property Mortgage. Buy a property that has positive rental flow from day one. Set Lease Rules and stick to them, ie, charge late rent payment fees. Renters can do more damage than you realize! Screen your tenants as if you were screening them to move in with you! I cannot stress this point enough. Do not buy a fixer upper unless you know for certain you have a contractor who does quality work for cheap or you’ve been selected to be on HGTV! Look for low property taxes, decent schools, low crime, plenty of amenities, parks, food, theater, bowling, grocery. Rental properties are not going to produce a large monthly income right out the gate, but picking the wrong property could be catastrophic. Own one property, or several, for a couple decades, create high net worth, use to supplement a retirement fund, pay off mortgage using your rental income, and sell when you a’re ready to cash out. Due to appreciation, you are likely to sell your property at a higher price than what you bought it at, which makes selling an exciting and profitable end goal to your investment! A common mistake is underestimating the amount of money it takes to renovate, cover unexpected damage, or unexpected legal and eviction fees. In Conclusion, investing in Rental Property or any Real Estate, is unpredictable and can have a boat load of both positives and negatives. WHEN YOU DO DECIDE YOU ARE READY, which if you are reading this, you are probably ready, #1 Create a Solid Plan, #2 Stick to it, #3 Buckle up and hold on for the exciting ride! Remember, investing in Rental Property is not going to make you rich quickly. Plan for the long term. One of the best attributes of Real Estate Investing is ownership. You cannot lose until you sell.